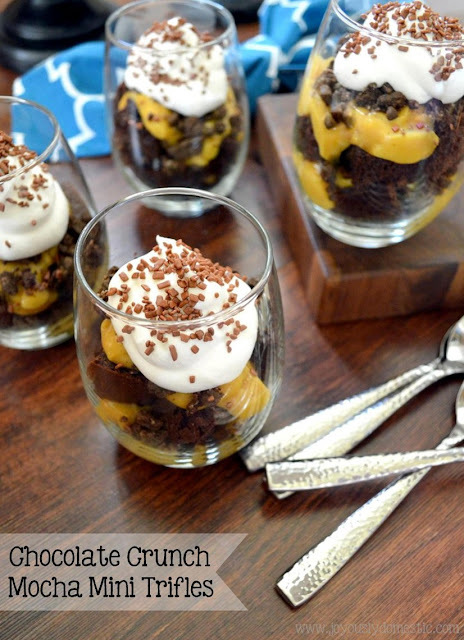 If you're looking for a simple-to-prepare dessert that is loaded with decadent chocolate and rich coffee flavor, these Chocolate Crunch Mocha Mini Trifles might just be your ticket to indulgent bliss. There are so many wonderful textures and flavors layered up in this dessert. Coffee-infused vanilla pudding and crushed chocolate sandwich cookies collide with chunks of moist chocolate cake in this magical treat. Smooth whipped cream and chocolate sprinkles finish off the layers in this crowd-pleasing dessert. I love mini desserts. They are so much fun to serve and even more fun to eat. I shared my Black Forest Mini Trifles with Vanilla Bean Whipped Cream with you just before Christmas last year. This dessert is quite similar in terms of preparation and presentation. I utilize a store-bought cake mix and boxed pudding mix here to make my time (and mess) in the kitchen less. I do make my whipped cream from scratch, but, of course, you could use a store-bought frozen whipped topping if you want to hasten things even more during prep time. Note that I do recommended assembling these, at least, a few hours in advance - even better if it can be the day before. However, I recommend waiting to add the chocolate sprinkles until shortly prior to service ... especially if presentation is important to you. The sprinkles can "bleed" into the whipped cream if placed on the trifles too far in advance. Allow cake to completely cool on countertop after baking. Cut cake into about 1-inch chunks/cubes. Set aside. In a medium mixing bowl, whisk together vanilla pudding mixes with the milk. Sprinkle in the coffee granules and whisk heartily for about two minutes. Allow pudding to rest (while granules dissolve) for about fifteen minutes. Whisk occasionally during this time to assist in dissolving granules into pudding. Pudding will be ready once no "specks" of coffee remain and pudding is a consistent "butterscotch" color. Set aside. In a deep mixing bowl (preferably chilled), beat whipping cream until soft peaks form. Sprinkle in sugar and beat again until close-to-firm peaks form. Do not overbeat. Set aside. To assemble the trifles, line up 8 glasses (mine were 15-ounce stemless wine glasses). Equally distribute half of the cake chunks between the glasses. Next, equally distribute half of the pudding on top of the cake chunks. Next, equally distribute half of the crushed cookies on top of the pudding. Repeat that same layering process one more time. Top each trifle with a dollop of whipped cream. Cover each glass tightly with foil/plastic wrap and store in refrigerator until time of service. Best made one day in advance, but allow to chill in fridge a minimum of three hours. Trifles will keep in refrigerator for a few days. Best served cold. At time of service, garnish with chocolate sprinkles or shaved chocolate.